As I type this Ash and I are around 40 minutes into the movie "The Informers," the film adaptation of Bret Easton Ellis' short story collection set in the 1980s. For some reason Kim Basinger and Billy Bob Thornton are here, but feel totally out of place. Now Ash tells me this gaunt woman on screen is Winona Ryder. The late Brad Renfro is looking awful in what is clearly his final role. 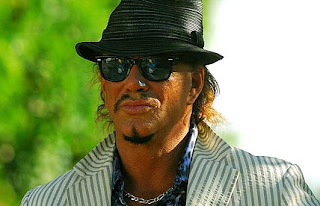 Mikey Rourke is cool, calm and collected and seems oddly at home as a human traffiker. Chris Issak shows up as the same character he always plays: Chris Issak. I will say that this piece does have an excellent sense of time and place. I can feel the 80's culture burning my retinas. We are never unsure of the popularity of things like Men Without Hats or Flock of Seagulls; and that's a good thing, I guess. The problem is that it doesn't go anywhere. The table setting is beautiful but the portions served are less than satisfying. I've seen two of the other three Ellis stories committed to celluloid, both of which I thoroughly enjoyed. This is to say "yes" to "Rules of Attraction" and "American Psycho" but "no" to "Less Than Zero." The book versions of all of these are set in the 80's, only "Less Than Zero" was actually MADE in the 80's and, until "Informers" anyway, was the most poorly reviewed of any of them. But objects in the rear view mirror, they appear closer than they are, don't they, Meatloaf? Everything looks better in hindsight. I even get nostalgic for this time period and I was probably a very lucky embryo when this was meant to be going on. All in all this feels like a missed opportunity. Cliche doesn't begin to describe the action on screen. A pool boy is eye raped by a bored, rich housewife. Impassioned speeches that begin with, "you think I don't know how much it hurts, man? ", are delivered. Around we go. In an age when most people wouldn't mind living the freewheeling synthesizer era where everything, good and bad, was abundant like never before, feeling pity for these supremely over-privileged subjects is far more difficult. In retrospect, it is no coincidence that the pivotal first scene of "Rules of Attraction" was filmed on Sept. 11, 2001. While making back its $4 million budget, it's paltry $6.5 million showing at the box office made a resounding flop financially. I say this even as it remains one of my top three favorite movies. 9/11 made everyone move past the point which Ellis' over-everythinged character studies could be appreciated. "The Informers" is the proof. Most everything is better with Al Green.